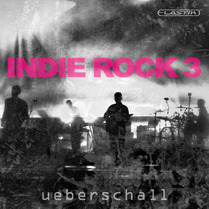 I’ve reviewed both of the earlier Elatik-based Indie Rock titles from Ueberschall in previous issues of SOS (January 2012 and June 2013 respectively) and the latest addition — Indie Rock 3 — follows a similar construction-kit format. What you get, therefore, is over 3.5GB of samples spread across some 1200 or so loops and divided amongst 10 song construction kits. Within each of these construction kits there are between five and eight musical sections so, in terms of building a complete musical bed, you have plenty to go on for typical intro, verse, chorus, breakdown and outro elements. As with many of the recent Elastik titles, one neat feature is the inclusion of not just pre-mixed stereo drum loops, but also separate loops for each element of the kit. You can therefore create your own drum mix based upon multiple mics from kick, snare (top and bottom), hi-hat, toms, cymbals, overheads and room mics. In terms of the instrument coverage, guitars and bass dominate, but there is also plenty of additional colour provided by some bass synths, pads, other synth parts and some nice sound effects. Given the dominance of guitars, it is also great to see DI’d versions of both the bass and guitar loops within each construction kit. Guitar tone is such a personal thing so, given that Elastik supports multiple outputs when used within a suitable DAW, it’s great to have the option of ‘re-amping’ your guitars through your guitar amp sim of choice when you want a different tone or level of overdrive/distortion. Stylistically, ‘indie rock’ is a pretty broad church, but it’s not difficult to imagine the majority of these kits within the typical Kerrang rotation, provided, of course, you added suitable vocal talent over the top of these instrumental beds. Compared to the earlier titles, there are perhaps a couple of kits in this library that stray more towards heavy rock (‘Go Ape’ and ‘Wanderlust’, for example) but nothing that would scare off too many small children. Throughout, the playing is very tight and the sounds spot on. I was particularly impressed with the drums and guitars and, given the large number of song sections within each kit, it is rather too easy to build a two-minute backing track in, well, not much more than two minutes. For busy media composers after an instant slice of contemporary indie rock, the kits are a breeze to use. Add your own vocals and a full song format can easily be achieved. Within the obvious limitations of working with the construction-kit format, Indie Rock 3 is top-notch stuff.